IN the aftermath of bitterly-contested election between them and a disputed result, President-elect Robert Mugabe is likely to engage outgoing Prime Minister Morgan Tsvangirai after the finalisation of his court petition in a bid to preclude the country from plunging into renewed turmoil. The need for talks between the two has become even more urgent in the wake of the loss of more than US$1 billion in the economy within days of Mugabe’s victory as a result of a sharp dip in the local stock market and panicky withdrawals from banks since last week. There was profuse haemorrhaging of the economy as the Zimbabwe Stock Exchange (ZSE) reacted negatively to Mugabe’s victory, with major counters on the local bourse crashing as their prices plummeted. The result was a loss of over US$1 billion in an economy whose Gross Domestic Product is unofficially US$7 billion, although official estimates claim it is US$11 billion. The ZSE’s market capitalisation was US$4,99 billion as at the close of trade yesterday, down from US$6,04 billion a day before the July 31 polls. The ZSE has two indices, namely the industrial and mining which remained largely depressed yesterday due to continued market uncertainty and volatility. As of 2009 Zimbabwe’s economy has been recovering from the ravages of a decade of hyperinflation and an attendant economic meltdown. The introduction of the US dollar as the primary means of exchange in February 2009, together with other base currencies, brought relative currency and exchange rate stability which in turn resulted in renewed investor confidence and increased investment flows. Amid fears Zimbabwe is sliding back to the era of empty shops and chaos, sources say Mugabe and Tsvangirai will meet soon after the election court case which everyone expects to be dismissed given Zimbabwe’s packed judicial benches and political pressure on judges. The case will be heard tomorrow. Sources said serious overtures were already underway. Tsvangirai hinted on the issue at a funeral in Harare on Wednesday. However, presidential spokesperson George Charamba yesterday said there were no talks between Mugabe and Tsvangirai, although he indicated the Zanu PF leader could have been benevolent to the premier if he had accepted defeat and not accused him of rigging. Charamba said contrary to claims by Tsvangirai that Mugabe initiated talks for a possible inclusive government, it was the former who made a passionate plea through an African ambassador, who cannot be named now for diplomatic reasons, to ask the veteran leader to include him in the new government. “We are still fighting in the courts and if there are any talks, it can only be after the pending case in which the MDC-T is seeking to reverse the election outcome,” said Charamba. Even after four years of recovery, Zimbabwe still faces power and water shortages, crumbling infrastructure, and high levels of poverty, with the IMF estimating annual per capita income, adjusted for currency variations, at US$589, the lowest in sub-Saharan Africa after the Democratic Republic of Congo. Given the vagaries in commodity prices, whose rise boosted recovery, economic growth is expected to slow to 3,4% this year, from 5% in 2012, according to official estimates — a gloomy picture of the situation which could turn Mugabe’s victory into a new political nightmare. Sources said Zanu PF has started making overtures to the MDC-T, with two senior ministers reaching out to their former counterparts in what insiders say is actually a two-way process behind the scenes amid a growing realisation by Mugabe and Tsvangirai that they need each other now more than ever before in recent years. Although Mugabe won the election, his controversial win rattled the markets and ravaged the economy within a fortnight. While Tsvangirai is said to be exasperated by his defeat and is thus publicly playing hardball as shown by his remarks at a funeral on Wednesday. Tsvangirai initially threatened to boycott all state institutions after the elections, but was forced to retreat in the face of a looming revolt against his leadership in his party. Although Tsvangirai indicated Mugabe was trying to reach out, Zanu PF spokesperson Rugare Gumbo described the pronouncements as daydreaming. However, the Zimbabwe Independent is reliably informed there are moves towards top-level talks aimed at ensuring progress secured during the inclusive government is not reversed. Sources say although Mugabe and Tsvangirai are acting belligerently in public, they both see the need to avoid plunging Zimbabwe into a new economic and political turmoil reminiscent of the 2008 period. Mugabe is seeking to salvage his legacy in preparation for a grand and decent exit after being blamed for running down the economy for three decades, while perpetrating human rights abuses on a grand scale, including the Gukurahundi massacres of the 1980s, Murambatsvina and the 2008 electoral killings. He seems keen on dealing with the situation before he leaves. “Mugabe may have won the political war, but he knows it will be difficult for him to win the economic war, hence his move to accommodate Tsvangirai. He is keen to move the country forward,” said a Zanu PF official. Even before the elections, there were indications Mugabe already had a plan to include MDC-T top officials in his new government to ensure political and economic stability. Sources said Mugabe and Tsvangirai were likely to meet after the finalisation of the election petition, while senior officials from both parties were understood to have recently met for talks over cabinet posts. But Charamba warned Tsvangirai could be shooting himself in the foot by refusing to accept the results as he was removing the goodwill that had developed during the life of the coalition government. He added the outgoing premier could “have been in a better position if he had accepted the results”. “Tsvangirai has two worries: to keep his divided party in shape, hence the creation of false initiatives, and feeding his supporters with illusions. He has asked African diplomats to make sure they negotiate with the president to include him in the government,” Charamba said. MDC-T organising secretary Nelson Chamisa said there were no talks, warning overture signals by Zanu PF were part of its trick to divert attention from the controversy surrounding Mugabe’s win. 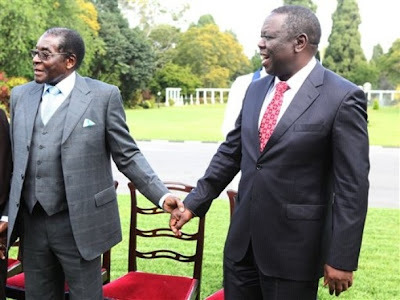 However, Tsvangirai on Wednesday said Mugabe had attempted to talk to him after the controversial July 31 elections. Other sources also confirmed this as well. “After stealing the vote, they don’t even know where to start. They are now asking ‘where is Tsvangirai, so that we can talk? Talk about what?’” he said.